Single Sign-On (SSO) was one of the biggest feature of v3.1, the system is now SAML 2 compliant. Having SSO makes it easier now for organisations to bypass the login stage and for users to go straight into working in Flowz. We now have bulk upload functions, which can be populated from a spreadsheet. This is now available for People and Assets. The development team are working on the upload of Flows. We have now re-branded the Flowz product and have changed the colour scheme to blue! In future releases, we will allow users to choose a colour scheme to match their organisation to help integrate it into the business. We have changed our Release Management processes and systems to make it easier to make changes in the system and then roll them out into the Live environment. New releases will now come out quicker. The Flowz development team are working on a lot of changes to the system, and will be looking to implement a range of new features in the coming months. We now have ready made templates available for new customers making it easier and quicker to set up. 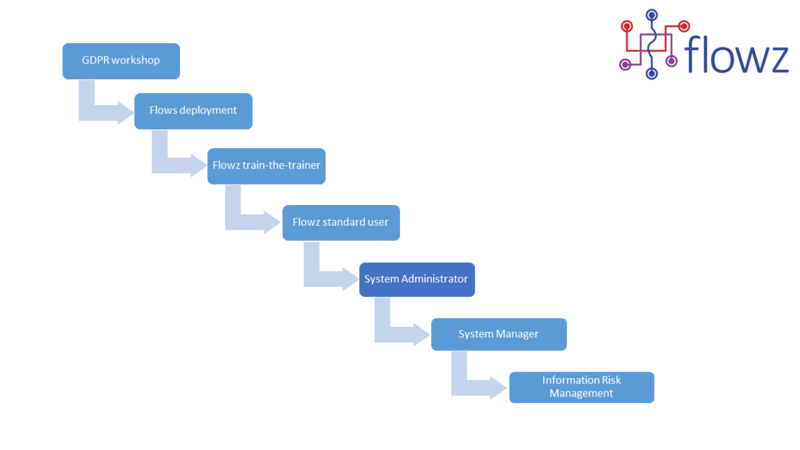 To improve our training, we have now broken it down into 7 different elements, based on user roles, and additional areas of consultancy services that could enhance your deployment. The training can be face to face or via WebEx and the WebEx sessions can be split up into smaller chunks to allow users to make the most of the training delivered. The next FUG will take place in autumn 2018. We will aim to get our FUG’s in line with the new developments occurring throughout the year, to allow users to discuss and understand changes made and have a better insight and input into what is coming in the future.